With the 30th Olympiad opening ceremony being a complete triumph of British history, humour and eccentricity, we thought we would celebrate the best Olympic ads of the London 2012 games and award them our very own Passion Digital medals. Brilliant ad copy job with this one! I hope Ussain got a chance to see this one. With florists being stopped from making Olympic ring arrangements and a café being told to stop serving their ‘Flaming Torch Baguette’, it takes some cunning ideas to get around the LOCOG ad police. Trust Paddy Power to pull it off. Genius! 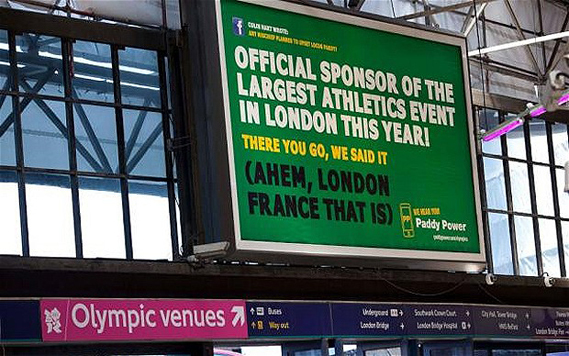 This is possibly the best Olympic ad police evasion example we have found. As you can imagine, there’s more than one London in the world, in fact there’s loads and Nike have taken advantage of that fact very cleverly. How many Londons can you spot? Smart and simple, this wine manufacture cleverly brandishes the Union Jack flag across a certain part of it’s copy to emphasise it’s own product. Plenty of Aussie-Brit banter behind it I’m sure! The guys who came up with this clearly do NOT need to go to one of their own branches. 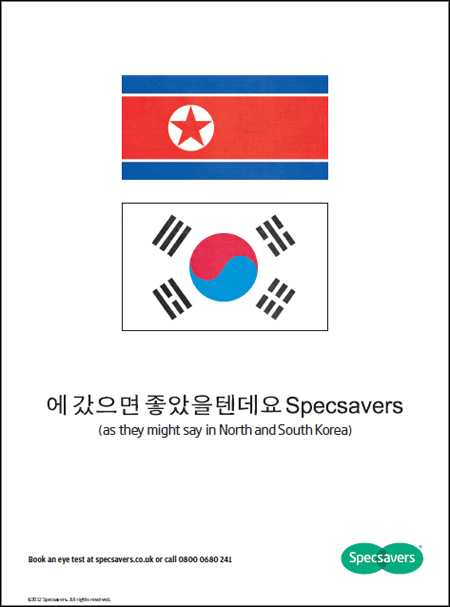 Within 24 hours, Specsavers whipped up this observation based on the Korean flag debacle which opened up London’s games. 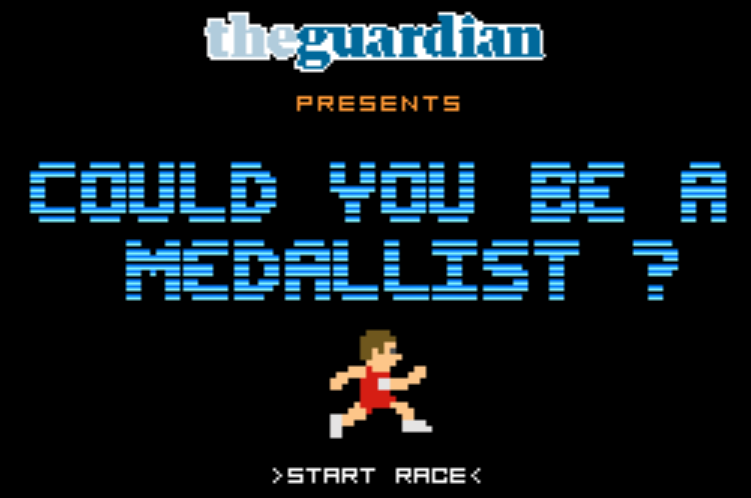 Guardian – Could You Be A Medallist? We love retro gaming and we love button bashing and this has both! We’ve all had a go in the office and haven’t managed to beat Ussain Bolt yet but it’s Friday afternoon, give us a couple of hours. 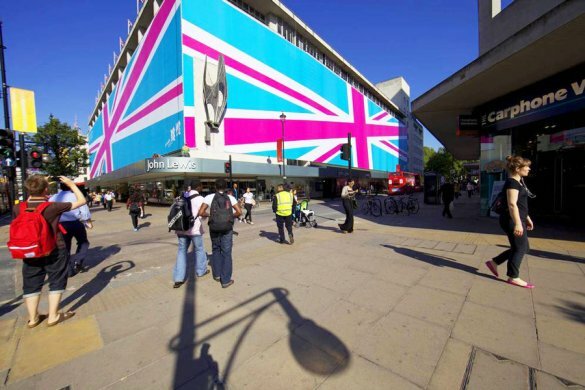 As official store provider to the Olympic games, John Lewis decided to cover their Oxford Street store in a ma-hoosive asymmetric Union Jack. It’s pretty difficult to miss! Getting Mark Ronson and Katy B together on a record isn’t much of a shock but when you see the clips of Ronson recording the sounds of Olympic athletes in action, it all becomes a wholy impressive ad. With Coca Cola being one of the global partners of Olympics, we predict even bigger campaigns throughout the games. A huge social effort from EDF, asking Twitter users to share their ‘energy’ throughout the games by using the hashtag #Energy2012. This ‘energy’ will then be reflected as a light show on the London Eye! Very clever indeed. 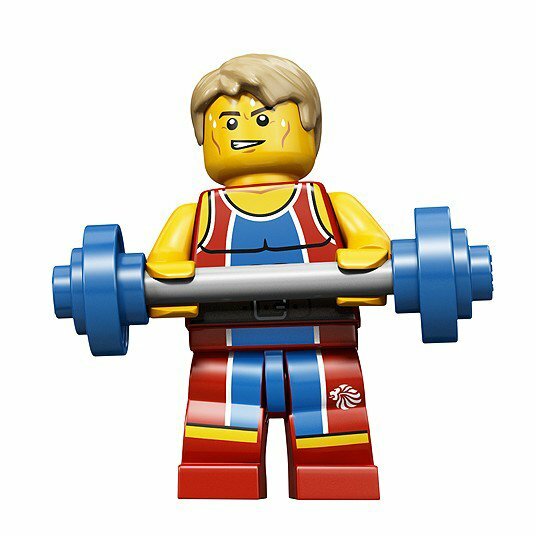 Lego have released 35 ads for their new “Great building, Great Britain” campaign to support its line of Team GB characters. They look awesome! Which one are you? One inspiring clip of athletic superpower and achievement after the other laden with a tint of gold. It’s ok. Then you realise the voice over actually IS Morgan Freeman and it becomes magical! The guys at More Than must be a little deflated. Adidas – What Will You Take? This is an epic Adidas Team GB athletefest! In classic Adidas form, they edit it together with dramatic abstract footage, from schoolboys jumping into a pool in reverse to raging bulls, all set in front of a gritty urban backdrop. An intense and suspense ridden class piece of ad. Featuring Team GB’s Jessica Ennis and USA’s Tyson Gay as the seconds tick down to the superstar athlete’s moment to shine. Any business that actively encourages people NOT to use its service must be confident. As part of BA’s “Don’t Fly” campaign, this great slice of social media asks you to enter your postcode, then watch as a BA jet taxis from Heathrow airport to the Olympic stadium via your house! With Channel 4 covering the Paralympic games in the UK, it’s no surprise that they conjoured up this 90 second masterpiece, soundtracked by Public Enemy. The team at Passion Digital unanimously voted this as our gold medal winner. All we can say is prepare yourself. A rich and moving piece that makes the hairs on your arms stand-up. Well there you go! 16 pieces of mammoth marketing! 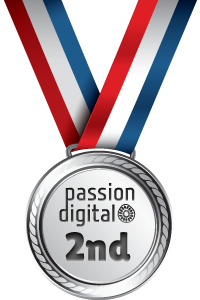 We’re sure there will be some epic campaigns over the next 3 weeks so we’ll report back then to show them to you. We’ll be cheering Team GB on throughout the games. We hope you do to! Have an immense London Olympics!